Second-generation feedstocks such as lignocellulosic hydrolysates are more and more in the focus of sustainable biotechnological processes. Corynebacterium glutamicum, which is used in industrial amino acid production at a million-ton scale, has been engineered towards utilization of alternative carbon sources. As for other microorganisms, the focus has been set on the pentose sugars present in lignocellulosic hydrolysates. Utilization of the hexuronic acids D-galacturonic acid (abundant in pectin-rich waste streams such as peels and pulps) and D-glucuronic acid (a component of the side-chains of plant xylans) for growth and production with C. glutamicum has not yet been studied. Neither aldohexuronic acid supported growth of C. glutamicum as sole or combined carbon source, although its genome encodes a putative uronate isomerase sharing 28% identical amino acids with UxaC from Escherichia coli. Heterologous expression of the genes for both uptake and catabolism of D-galacturonic acid and D-glucuronic acid was required to enable growth of C. glutamicum with either aldohexuronic acid as the sole carbon source. When present in mixtures with glucose, the recombinant C. glutamicum strains co-utilized D-galacturonate with glucose and D-glucuronate with glucose, respectively. 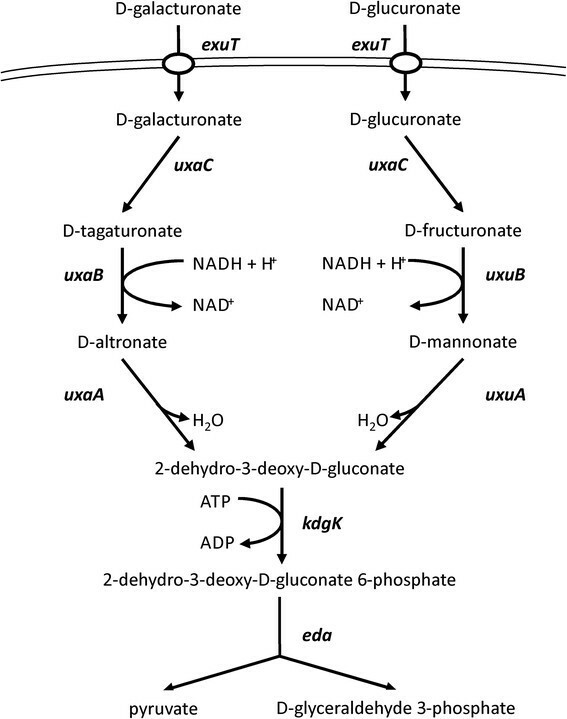 When transformed with the plasmid for uptake and catabolism of the aldohexuronates, model producer strains were able to grow with and produce from D-galacturonate or D-glucuronate as sole carbon source. An easily transferable metabolic engineering strategy for access of C. glutamicum to aldohexuronates was developed and applied to growth and production of the amino acids L-lysine and L-ornithine as well as the terpene lycopene from D-galacturonate or D-glucuronate. Corynebacterium glutamicum is a rod-shaped Gram-positive aerobic bacterium, which can be found in soil, sewages, vegetables, and fruits . This bacterium is capable of utilizing various sugars as well as organic acids . Among others, C. glutamicum has the ability to metabolize glucose, fructose, and sucrose as well as lactate, pyruvate, and acetate -. Characteristic of C. glutamicum is the capability of growing on mixtures of different carbon sources with a monoauxic growth , as opposed to diauxic growth observed for many other microorganisms such as Escherichia coli and Bacillus subtilis. Only a few exceptions have been reported as in the case of glucose-ethanol or acetate-ethanol mixtures, where preferential substrate utilization was observed . Since its discovery, C. glutamicum has become an indispensable microorganism for the biotechnological industry . From its initial use as a natural L-glutamate producer , it is currently used for production of other amino acids such as L-lysine, L-ornithine, L-methionine, and L-aspartate -. However, its importance has further increased as it was for production of of non-natural products  such as isobutanol , ethanol , putrescine ,,, cadaverine , carotenoids and terpenoids -, and xylitol . Recently, efforts with C. glutamicum have shifted from optimizing production processes to also include access to alternative carbon sources. As yet, feed in the industry relies mainly on glucose and fructose , which also have competing uses in the food industry. So far, alternative carbon source utilization in C. glutamicum has been successfully established, among others, for xylose ,, galactose , arabinose ,, glucosamine , N-acetyl-glucosamine , and glycerol . Plant cell wall materials such as lignocellulose and pectin are promising alternatives as carbon source. These materials are readily and abundantly available as agricultural waste or forestry residues . Among the sugar constituents of plant cell wall are the hexuronic acids D-galacturonate and D-glucuronate found in pectin. These acidic sugars are naturally consumed by most plant pathogenic bacteria such as Erwinia carotovora, Pseudomonas syringae, and Agrobacterium tumefaciens, but also by E. coli. There are three pathways for utilization of hexuronic acids, namely via isomerization, oxidation, and reduction . The isomerization pathway in E. coli consists of seven reactions, which yield the central intermediates D-glyceraldehyde-3-phosphate and pyruvate (Figure 1). Both uxaC-uxaA and uxuA-uxuB are located within operons. However, these operons and the remaining genes are not clustered but spread across the genome of E. coli. The genes kdgK and eda belong to the modified Entner-Doudoroff pathway, which is present in many Gram-negative bacteria, pseudomonads, and Archaea . Bioinformatic analysis revealed an uxaC ortholog in the genome of C. glutamicum with 28% protein similarity to that of E. coli. However, homologs of uxaB, uxuA, uxuB, kdgK, and eda appear to be absent. Therefore, in this work, C. glutamicum was engineered for the uptake and utilization of D-galacturonate and D-glucuronate as alternative carbon sources. The potential of this synthetic pathway was then analyzed with respect to the production of the amino acids L-lysine and L-ornithine as well as the carotenoid lycopene. Schematic representation of the D-galacturonate and D-glucuronate catabolic pathways of E. coli . Gene names are given adjacent to the reactions: eda, 2-keto-3-deoxygluconate-6-phosphate aldolase; exuT, uptake system for hexuronic acids; kdgK, 2-keto-3-deoxygluconokinase; uxaA, altronate dehydratase; uxaB, altronate oxidoreductase; uxaC, uronate isomerase; uxuA, mannonate dehydratase; uxuB, mannonate oxidoreductase. The wild-type strain C. glutamicum ATCC 13032 used in this study was obtained from the American Type Culture Collection (ATCC). Other strains include C. glutamicum ORN1 , C. glutamicum DM1933 , and C. glutamicum ΔcrtYEB that are derived from the wild-type strain (Table 1). The hexuronic acid utilization and transporter genes originated from E. coli MG1655, whereas the strain E. coli DH5α  was used for plasmid construction. Both E. coli strains were obtained from the Coli Genetic Stock Center (CGSC). For cultivations, the Luria broth (LB) complex medium and CGXII minimal medium  were used and contained glucose, D-galacturonate, or D-glucuronate in concentrations as indicated in the ‘Results’ section. Kanamycin (25 μg ml−1), spectinomycin (100 μg ml−1), and/or isopropyl-β-D-thio-galactopyranoside (IPTG; 20 μM) were added to the medium when necessary. Cultivations were carried out in 50-ml cultures in 500-ml baffled Erlenmeyer flasks on a rotary shaker at 120 rpm and 30°C for C. glutamicum or 37°C for E. coli. In both cases, the growth in liquid cultures was followed by measuring the optical density at 600 nm (OD600). aStatistical evaluation was carried out with the t-test, where p ≤ 0.05, log expression ratio M ≥ 1.5 or ≤ −1.5, and signal intensity A ≥ 10. Values are averages of three independent cultivations. Standard procedures were used for plasmid and chromosomal DNA isolation, molecular cloning, and transformation of E. coli. Plasmid isolation for C. glutamicum was carried out as described previously . Transformation of C. glutamicum by electroporation was carried out as described . PCR experiments were carried out in a thermocycler (Analytik Jena AG, Jena, Germany) with KOD Hot Start DNA Polymerase (Novagen, Merck KGaA, Darmstadt, Germany) and with oligonucleotides obtained from Eurofins MWG Operon (Eurofins Genomics, Ebersberg, Germany) as listed in Table 2. Restriction enzymes, T4 DNA Ligase, and alkaline phosphatase were obtained from New England BioLabs, Inc. (Ipswich, MA, USA) and used according to the manufacturer's protocol. For the construction of pHexA, the uxaCA and uxuAB operons as well as genes uxaB, kdgK, and eda were amplified by PCR from E. coli MG1655. The uxaCA operon was amplified with primers G1a + G1b resulting in a 2,981-bp product, whereas the uxuAB operon was amplified with primers G3f + G3c resulting in a 2,775-bp product. Gene uxaB was amplified with primers G2d + G2c, gene kdgK with primers G4d + G4c, and eda was amplified with primers G5d + G5c resulting in 1,519-, 997-, and 709-bp PCR products, respectively. Through these primers, appropriate linker sequences and a ribosomal binding site (RBS) sequence were attached to each gene or operon to facilitate the Gibson assembly . The genetic load was first divided due to the insert size. Therefore, genes uxuAB, kdgK, and eda were cloned into the SmaI-digested pEKEx3 resulting in pEKEx3-uxuAB-kdgK-eda, designated as pAB5. The insert of pAB5 was amplified via PCR with primers G3d and G5d with a 4481-bp PCR product. The pAB5 amplicon, uxaB, and uxaCA were then used for Gibson assembly into the SmaI-digested pEKEx3 and yielded the final vector pHexA. The aldohexuronate transporter gene exuT was amplified via PCR with primers ExuT-fw and ExuT-rv from E. coli MG1655 and used for Gibson assembly into the BamHI-digested pVWEx1. The plasmid inserts were verified by sequencing (Sequencing Core Facility CeBiTec, Bielefeld, Germany), and the plasmids were used to transform C. glutamicum ATCC 13032. C. glutamicum ATCC 13032 was cultivated in CGXII medium with 50 mM D-galacturonate plus 50 mM glucose, 50 mM D-glucuronate plus 50 mM glucose, or 50 mM glucose as carbon source. Exponentially growing cells were harvested after 4 h. RNA isolation, cDNA synthesis, and microarray hybridization were performed according to previous protocols . Microarray images were analyzed with ImaGene software (BioDiscovery, Inc., Hawthorne, CA, USA), whereas the EMMA platform was used for data evaluation. To evaluate the amino acid and carbohydrate production, culture samples were taken and centrifuged (13.000×g, 10 min), and the supernatant analyzed by high-pressure liquid chromatography (HPLC, 1200 series, Agilent Technologies Inc., Santa Clara, CA, USA) as described previously ,. Protein alignments were carried out via the BLASTP algorithm  of NCBI (Bethesda, MD, USA). The GenBank accession number for the annotated genome sequence of C. glutamicum ATCC 13032 and E. coli MG1655 is NC_006958  and NC_000913 , respectively. D-galacturonate and D-glucuronate were tested as potential carbon sources of C. glutamicum. However, although its genome encodes a putative uronate isomerase sharing 28% identical amino acids with UxaC from E. coli, both compounds did not support growth as sole carbon sources at 50 mM (data not shown). When present in addition to 50 mM glucose, C. glutamicum wild type (WT) grew to comparable maximal OD600 values of about 18 irrespective of the presence or absence of D-galacturonate or D-glucuronate (data not shown). Surprisingly, the presence of 50 mM D-galacturonate in minimal medium with 50 mM glucose accelerated growth slightly (0.24 h−1 as compared to 0.17 h−1), while the addition of 50 mM D-glucuronate to glucose minimal medium slowed growth of WT (0.13 h−1). These observations prompted us to carry out DNA microarray experiments to study global gene expression under these conditions. Genes differentially expressed in cells growing exponentially with 50 mM D-galacturonate plus 50 mM glucose, 50 mM D-glucuronate plus 50 mM glucose, and 50 mM glucose alone are listed in Table 2. As expected, the presence of D-galacturonate elicited different gene expression changes than D-glucuronate. Since neither D-galacturonate nor D-glucuronate was metabolized, these gene expression changes are likely due to regulatory or secondary effects. To elicit such regulatory changes, transport of minute amounts of D-galacturonic or D-glucuronic acid might be sufficient. Increased expression of fermentative lactate dehydrogenase gene ldhA in the presence of D-glucuronate might have slowed growth with glucose since lactate is known to accumulate transiently and since high ldhA levels have been implied to slow growth of C. glutamicum with sugars . Furthermore, expression of the gene for subunit omega of RNA polymerase was reduced, thus transcription might have been negatively affected more in general. The gene expression changes due to the presence of D-galacturonate did not allow deriving a potential explanation for faster growth with glucose. However, decreased expression of cg1551 encoding putative universal stress protein UspA is in line with faster growth of C. glutamicum in the presence of D-galacturonate. Plasmid pHexA was constructed for heterologous expression of the E. coli genes for degradation of D-galacturonate and D-glucuronate to the glycolytic intermediates pyruvate and glyceraldehyde-3-phosphate. To this end, the operons uxaCA and uxuAB as well as genes uxaB, kdgK, and eda were cloned with attached RBS sequences as synthetic operon into IPTG-inducible gene expression vector pEKEx3. The resulting plasmid pHexA was used to transform C. glutamicum WT. However, the transformants were unable to grow with either D-galacturonate or D-glucuronate as sole carbon sources (data not shown). Since endowing C. glutamicum with D-galacturonate or D-glucuronate catabolism proved insufficient for utilization of these substrates, the gene for the respective uptake system exuT was co-expressed from a compatible plasmid. In preliminary experiments, C. glutamicum WT(pHexA)(pVWEx1-exuT) did indeed grow with either D-galacturonate or D-glucuronate as sole carbon source, however, very slowly. Based on the assumption that overproduction of transmembrane protein ExuT perturbed growth, the concentration of the inducer IPTG was titrated. Moreover, it was required to pre-cultivate the strain in minimal medium with a mixture of 50 mM glucose and 50 mM of either D-galacturonate or D-glucuronate as carbon source. In the main culture with 50 mM of either D-galacturonate or D-glucuronate, no growth was observed for C. glutamicum WT(pHexA)(pVWEx1). By contrast, C. glutamicum WT(pHexA)(pVWEx1-exuT) was able to grow with D-galacturonate and D-glucuronate, respectively, with growth rates of 0.06 ± 0.01 and 0.05 ± 0.01 h−1, respectively (data not shown). Thus, these results revealed that C. glutamicum WT lacks the ability for uptake and catabolism of hexuronic acids and that heterologous expression of the genes from E. coli for uptake and catabolism of hexuronic acids enabled access of C. glutamicum to D-galacturonate and D-glucuronate as growth substrates. A hallmark of C. glutamicum is its ability to co-utilize various carbon sources when these are added as carbon source mixtures. To assay if hexuronic acids are utilized simultaneously with glucose, the preferred carbon source of C. glutamicum, the growth and substrate consumption of C. glutamicum WT(pHexA)(pVWEx1) in minimal medium containing either 100 mM D-galacturonate plus 100 mM glucose or 100 mM D-glucuronate plus 100 mM glucose were determined (Figure 2). In minimal medium with the mixture of D-galacturonate plus glucose, C. glutamicum WT(pHexA)(pVWEx1) grew with a growth rate of 0.25 ± 0.02 h−1 and co-utilized glucose with D-galacturonate (Figure 2). Specific uptake rates of 28 ± 3 and 39 ± 4 nmol (mg cell dry weight (CDW))−1 min−1 were derived for utilization of D-galacturonate and glucose, respectively. In minimal medium with a blend of 100 mM D-glucuronate plus 100 mM glucose, both carbon sources were utilized simultaneously and support a growth rate of 0.25 ± 0.02 h−1 for C. glutamicum WT(pHexA)(pVWEx1) (Figure 2). The specific uptake rates were 21 ± 2 nmol (mg CDW)−1 min−1 for glucose and 18 ± 2 nmol (mg CDW)−1 min−1 for D-glucuronate. Growth of C. glutamicum strains WT(pHexA)(pVWEx1- exuT ) with blends of D-glucose and D-galacturonate (A) or D-glucose and D-glucuronate (B). Residual concentrations of D-galacturonate (closed squares), D-glucuronate (closed diamonds), and D-glucose (open triangles) and OD600 values (closed circles) are given as means and standard deviations of triplicate cultivations in CGXII minimal medium, pH 6.3, with 20 μM IPTG, and either a mixture of 100 mM D-galacturonate and 100 mM D-glucose (A) or a mixture of 100 mM D-glucuronate plus 100 mM D-glucose (B) as carbon sources. The natural substrate spectrum of C. glutamicum has been broadened to realize a flexible feedstock concept for production processes using this bacterium -. To test if recombinant C. glutamicum strains engineered to accept D-galacturonate and D-glucuronate as growth substrates are able to produce, e.g., amino acids from these substrates, model L-lysine, L-ornithine, and lycopene producer strains were transformed with plasmids pHexA and pVWEx1-exuT. These strains were cultivated in CGXII minimal medium with 20 μM IPTG and either 100 mM D-galacturonate or 100 mM D-glucuronate as sole carbon source. The lysine-producing strain C. glutamicum DM1933 carries a number of chromosomal changes known to be beneficial for L-lysine production . DM1933(pHexA)(pVWEX1-exuT) hardly grew with either D-galacturonate or D-glucuronate (Table 3). However, DM1933(pHexA)(pVWEX1-exuT) produced 6.5 ± 0.2 mM L-lysine from 100 mM D-galacturonate and 9.3 ± 1.1 mM L-lysine from 100 mM D-glucuronate (Table 3). CGXII minimal medium was used with 100 mM of the indicated carbon source. Lycopene accumulates in C. glutamicum ΔcrtYEb due to disruption of the pathway for biosynthesis of the endogenous carotenoid decaprenoxanthin . C. glutamicum ΔcrtYEb(pHexA)(pVWEX1-exuT) grew with D-galacturonate (0.02 ± 0.01 h−1) and D-glucuronate (0.04 ± 0.01 h−1), respectively, as sole carbon source (Table 3). The strain produced 0.7 ± 0.1 mg (g CDW)−1 lycopene in minimal medium with D-galacturonate and 0.8 ± 0.3 mg (g CDW)−1 lycopene with D-glucuronate (Table 3). C. glutamicum ORN1 is an L-arginine auxotrophic derivative of C. glutamicum WT that secretes L-ornithine due to deletions of the L-ornithine carbamoyltransferase gene argF and the L-arginine biosynthesis repressor gene argR. When supplemented with either 0.75 mM or 0.125 mM L-arginine, C. glutamicum ORN1(pHexA)(pVWEX1-exuT) grew in D-galacturonate and D-glucuronate minimal medium with growth rates of about 0.04 ± 0.01 h−1 (Table 3). However, L-ornithine accumulated only to low concentrations corresponding to yields of about 1 to 2 mol% (Table 3). C. glutamicum WT is not capable of utilizing hexuronic acids. Heterologous expression of gene for catabolism and uptake of the hexuronic acid pathway from E. coli in C. glutamicum enabled utilization of both D-galacturonate and D-glucuronate as sole carbon sources in minimal medium. Moreover, both hexuronates were co-utilized with glucose by the recombinant C. glutamicum strains developed here. Simultaneous utilization of several carbon sources as required for efficient utilization of substrate mixtures such as in lignocellulosic hydrolysates is a hallmark of C. glutamicum, and also pertains to co-utilization of non-native substrates by the respective recombinants ,,,-. Notably, the aldohexuronate transporter ExuT was strictly required, indicating that C. glutamicum lacks the capacity to import sugar acids. ExuT belongs to the major facilitator superfamily (MFS) class of transporters, more specifically to the anion:cation symporter (ACS) family . This class of symporters transfers organic/inorganic anions while simultaneously co-transporting H+/Na+, respectively. ExuT has not been reported to transport other substrates than the aldohexuronic acids. Inspection of the genome of C. glutamicum WT showed only one protein with 22% similarity to ExuT, namely putative lincomycin resistance protein LMRB (YP 226924.1). Engineering C. glutamicum for growth with other non-native carbon sources does not necessarily require heterologous expression of a gene encoding a transport system. Introduction of catabolic genes for conversion of glycerol, arabinose, and xylose was sufficient to enable utilization of these carbon sources by these recombinant C. glutamicum strains, while additional introduction of the respective uptake system accelerated carbon source utilization ,,,,. Transport engineering was not required for the amino sugar glucosamine, which is a substrate of the endogenous glucose-specific PTS , whereas the amino sugar N-acetylglucosamine could only be utilized if NagE from the related Corynebacterium glycinophilum was introduced . In the latter case as well as in the present study, it was necessary to adjust the concentration of the inducer IPTG. It is often observed that too high levels of a transmembrane protein such as a transport protein results in growth perturbation ,. In addition, expression levels of several genes of a pathway may need to be tuned to avoid accumulation of potentially inhibitory intermediates as demonstrated for C. glutamicum engineered for decaprenoxanthin overproduction . It is not known if the recombinant C. glutamicum strain WT(pHexA)(pVWEX1-exuT) would be able to grow with sugar acids related to the aldohexuronates D-galacturonate and D-glucuronate since ExuT is specific for aldohexuronate uptake. In E. coli, the intermediate of aldohexuronate catabolism D-fructuronate serves as carbon source and its utilization requires uptake by GntP . C. glutamicum possesses GntP for gluconate uptake , but it is unknown whether GntP from C. glutamicum accepts D-fructuronate or the related intermediates of aldohexuronate catabolism D-tagaturonate, D-altronate, or D-mannonate as substrates. Recently, it was shown that E. coli may grow with L-galactonate and L-gulonate as sole carbon sources with L-galactonate-5-dehydrogenase YjjN being required for their conversion to D-tagaturonate and D-fructuronate, respectively . Under osmotic stress conditions, E. coli may use a different pathway, i.e., 5-keto 4-deoxyuronate isomerase KduI and 2-deoxy-D gluconate 3-dehydrogenase KduD may compensate for reduced levels of UxaC, UxaB, and UxuB under osmotic stress conditions . Since ExuT from E. coli was required for aldohexuronate utilization by recombinant C. glutamicum, it is likely that introduction of the respective uptake systems for the related sugar acids described above is a prerequisite for their use as carbon sources. Degradation of aldohexuronate to pyruvate yields one mole of ATP per mole of aldohexuronate by substrate-level phosphorylation as compared to two moles of ATP per glucose in the Embden-Meyerhof-Parnas (EMP) pathway of glycolysis as present in C. glutamicum. In the EMP pathway of glycolysis, two moles of nicotinamide adenine dinucleotide (NADH) are generated from glucose, while no net formation of NADH occurs in aldohexuronate conversion to pyruvate (Figure 1). The maximal OD600 values reflecting the maximal biomass concentration with 50 mM D-galacturonate consequently were lower (OD600 of about 6.5) than with 50 mM glucose (OD600 of about 18). The maximal OD600 (about 4.5) with 50 mM D-glucuronate was even lower (data not shown). The reduced biomass yields for aerobic growth with the aldohexuronates can be explained at least in part by their lower ATP yields as compared to glucose catabolism. The growth rates in minimal medium with D-galacturonate (0.06 h−1) and D-glucuronate (0.05 h−1), respectively, obtained with C. glutamicum WT(pHexA)(pVWEx1-exuT) are five to six times lower than with glucose. Aldohexuronate utilization may be accelerated, e.g., by improving heterologous gene expression or by using catabolic enzymes of other microorganisms as in the case of xylose . Instability of the plasmids pHexA and pVWEX1-exuT were not observed in the experiments described here; however, it might be possible that plasmid instability poses a challenge when using these strains in large fermentation vessels. The low biomass yields and slow growth rates observed with C. glutamicum WT(pHexA)(pVWEx1-exuT) were also found when the respective plasmids were transformed into model producer strains. The product yields observed were low, e.g., about 6 to 9 mol% for L-lysine (Table 3). Thus, the aldohexuronates are not good substrates for growth and production by C. glutamicum. However, endowing C. glutamicum strains with aldohexuronate catabolism may be a requirement for complete and efficient utilization of second-generation feedstocks ensuring that not only the major sugar fractions are converted to value-added products. Access of C. glutamicum to the aldohexuronates D-galacturonate and D-glucuronate was established by heterologous expression of genes for catabolism and uptake of the aldohexuronates from E. coli in C. glutamicum. This metabolic engineering strategy could be applied to D-galacturonate- or D-glucuronate-based growth and production of the amino acids L-lysine and L-ornithine as well as the terpene lycopene. We thank Petra Peters-Wendisch for help with artwork. Work in the lab of the authors was funded in part by grants 0315589G from BMBF in the CRP ‘Corynebacterium: improving flexibility and fitness for industrial production’. AH planned and performed the experiments, analyzed the data, and drafted the paper. IK performed the experiments and analyzed the data. SNL planned the experiments and analyzed the data. VFW designed and coordinated the study, analyzed the data, and wrote the paper. All authors read and approved the final manuscript.